The Platform of Human Rights Organisations in Malta (PHROM) is the first and only coalition of Maltese civil society organisations operating in the area of human rights protection and promotion. National, regional and international networking and partnerships. Information on PHROM’s present and future projects can be found below. How does one measure a State’s human rights performance? What factors do we need to look at? What research methodology should be adopted, to ensure an approach that is comprehensive as well as inclusive of multiple voices, including the most vulnerable and excluded? ‘Malta Human Rights Indicators Project’ will formulate measurable goals against which human rights performance – state, NGO and other – can be regularly measured. These indicators will allow Malta to establish SMART goals for policy and law-making, allowing for multi-annual assessment and comparability. You can access the project page here. Il-Librerija is an online database of all published documentation relevant to human rights in Malta. It gathers various forms of documents including primary and secondary legislation, NGO and institutional reports, and academic papers in a user-friendly fully searchable format. Every document is also given a number of Keywords to facilitate search and classification. Il-Librerija is regularly updated by PHROM interns, but we are more than happy to receive any document you think ought to be included. You can access Il-Librerija here. The Annual Human Rights Report is the lead document in the provision of comprehensive information on the state of human rights in Malta. It is based on an inclusive and expert research methodology that seeks input from all PHROM’s Member Organisations and other relevant stakeholders, so as to ensure it is truly comprehensive and representative of the voice of civil society organisations. Together with information on legal and policy frameworks, the Report presents key areas of concern, provides technical recommendations and identifies those themes particularly relevant to the reporting year. The Report is launched in the months following the reporting year, and can be downloaded at the specific project page here. PHROM’s Advocacy Assistant will provide its Member Organisations with a one-stop-shop for their advocacy requirements. The Assistant will be an interactive online toolbox through which our Member Organisations will be able to build tailor-made campaigns, surveys, events, public relations activities and other elements necessary for effective human rights advocacy. 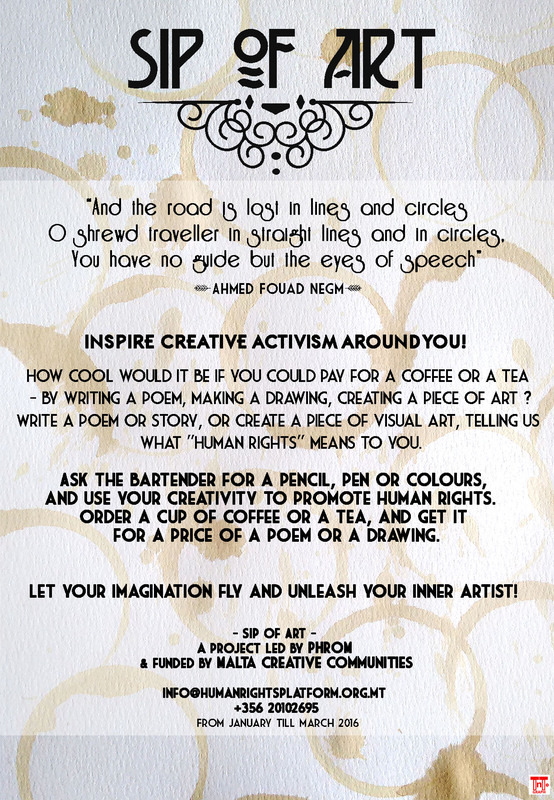 With the support of the Creative Communities fund managed by Arts Council Malta, PHROM is inviting local business communities, artists and the general public to think about human rights through art. 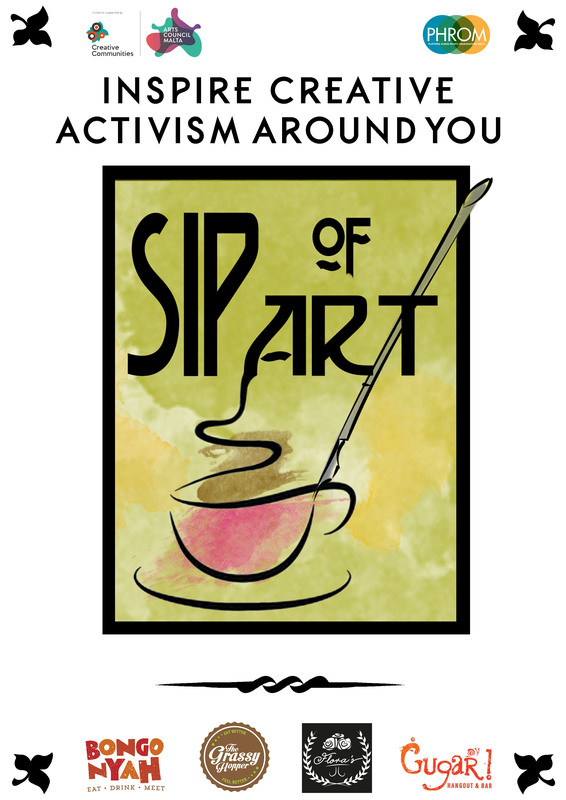 ‘Sip of Art’ will provide cafeterias with colourful materials to stimulate the creation of human rights-inspired artworks, in exchange for a cup of tea or coffee! Participating cafeterias will give a cup of tea or coffee for an artwork created on premises, as long as inspired by a human rights theme. If you are a cafeteria and interested in participating, get in touch with us. Funded by the Malta Community Chest Fund, STRINGS is based on PHROM’s core approach to fundamental human rights and will be implemented jointly with our Member Organisation Breaking Limits. Human Rights in the European Union (30 April) – With the participation of the EU Fundamental Rights Agency, this workshop will give an insight into the EU’s Fundamental Rights Charter and how human rights NGOs can use this document in advocacy, client-work, public awareness, etc. Improved networking amongst human rights NGOs (25 June) – This will be an extremely hands-on facilitated session to guide Member Organisations through efficient ways of cooperating with each other. We’ll work on tools and systems aimed at providing stronger services and at stronger human rights advocacy. Human Rights in Malta (5 March) – This workshop will look at where Malta stands vis-á-vis human rights, and encourage a discussion on where the country is going. Member Organisations will have the opportunity to look at new laws, policies and organisations and formulate strategies, raise challenges and agree on a way ahead. All sessions are being held from 9.30 to 13.30, at the Victoria Hotel (Sliema). Coffee and a light lunch will also be served to encourage Member Organisation networking and discussions. The project will also organise engage in technical discussion with Member Organisations on the formulation of a PHROM Code of Ethics for a Rights-Based approach towards Service-Provision. This publication will be publicly launched at the project’s end.